6 Pack Photo Editor is a free Windows 8 and 8.1 app which enables you to add 6 pack abs to your photos. As we all know, getting 6 pack abs is very difficult. It requires a lot of hard work in doing exercises and gym practices. 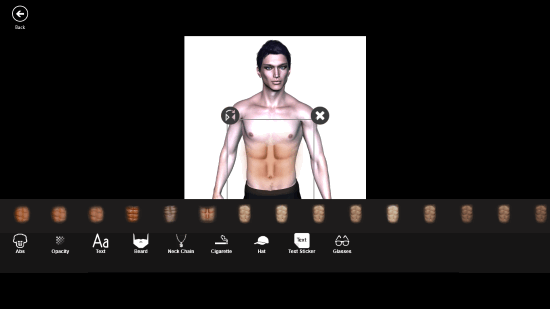 Getting six pack abs has now become easier with this six pack photo editor for Windows 8. If you love bodybuilding, this app is made for you. Download this fake 6 pack abs editor for Windows 8 on your system, create your makeover photos and share them on WhatsApp, Facebook, and Twitter, and surprise your friends. This app gives you instant abs. Get it now on Windows Store! This 6 pack photo editor app for Windows 8 is very easy to install. A link is provided at the end of the article. Click on the link and Windows will take you to the installation page. At the installation page, click on the Install button and Windows will download and install the app on your computer automatically. You can also install the app directly from Windows Store simply by searching the app by its name. To add abs to your photos, just click on the Abs option and choose the type of abs from the list of abs available. The abs options have different ab colors and build to match your photo, color, and body structure. 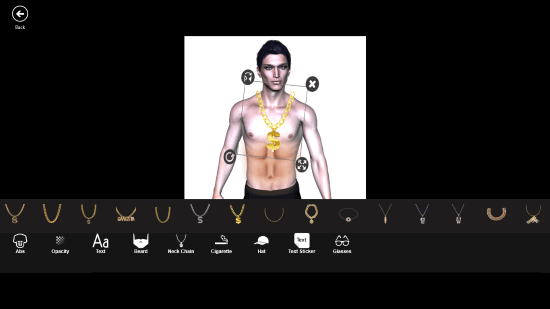 Besides this, the free six pack abs app comes with some more features, like – you can add glasses, neck chains, hats, or more. Even different types of cigarettes are also available in the app, which you can add to your photo. After selecting a sticker of your own choice, you have to resize it, so that it can completely fit the photograph. To resize any sticker, tap/click on the sticker and stretch/contract it from the bottom-right corner. Rotate the stickers so that they can fit the image completely. Just click on the sticker and rotate it from the bottom-left corner. By following these simple steps, you can edit any photograph with the help of this free 6 pack abs editor app for Windows 8. So, what are you waiting for? Get this app now and have fun! This fake 6 pack abs editor app is a lightweight gym photo editor app that doesn’t occupy much space on your computer. Download this app from Windows Store and leave your friends speechless. Install it on your system and enjoy editing photos! Download 6 Pack Abs Photo Editor for Windows 8 and Windows 8.1.